(Nanowerk News) Nanocomposite oxide ceramics have potential uses as ferroelectrics, fast ion conductors, and nuclear fuels and for storing nuclear waste, generating a great deal of scientific interest on the structure, properties, and applications of these blended materials. "The interfaces separating the different crystalline regions determine the transport, electrical, and radiation properties of the material as a whole," said Pratik Dholabhai, principal Los Alamos National Laboratory researcher on the project. "It is in the chemical makeup of these interfaces where we can improve features such as tolerance against radiation damage and fast ion conduction." 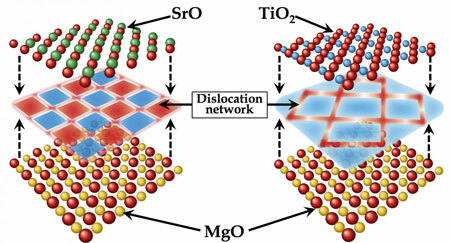 This is a schematic depicting distinct dislocation networks for SrO- and TiO2-terminated SrTiO3/MgO interface. A composite is a material containing grains, or chunks, of several different materials. In a nanocomposite, the size of each of these grains is on the order of nanometers, roughly 1000 times smaller than the width of a human hair. In the context of nuclear energy, composites have been proposed for the fuel itself, as a way for example, to improve the basic properties of the material, such as the thermal conductivity. It is the thermal conductivity that dictates how efficiently energy can be extracted from the fuel. Composites have also been created to store the by-products of the nuclear energy cycle, nuclear waste, where the different components of the composite can each store a different part of the waste. However, composites have much broader applications. The interfaces provide regions of unique electronic and ionic properties and have been studied for enhance conductivity for applications related to batteries and fuel cells. Using simulations that explicitly account for the position of each atom within the material, the Los Alamos research team examined the interface between SrTiO3 and MgO, demonstrating, for the first time, a strong dependence of the dislocation structure at oxide heterointerfaces on the termination chemistry ("Termination chemistry-driven dislocation structure at SrTiO3/MgO heterointerfaces"). SrTiO3 can be viewed like a layer cake, with alternating planes of SrO and TiO2. Thus, in principle, when matching SrTiO3 with another material, there is a choice as to which layer is in contact with the other material. The simulations reveal that SrO- and TiO2-terminated interfaces exhibit remarkably different atomic structures. These structures, characterized by so-called misfit dislocations that form when the two materials do not exactly match in size, dictate the functional properties of the interface, such as the conductivity. The observed relationship between the termination chemistry and the dislocation structure of the interface offers potential avenues for tailoring transport properties and radiation damage resistance of oxide nanocomposites by controlling the termination chemistry at the interface. This could lead to new functional materials in a number of technological areas. "We believe that this discovery, that the interface structure is sensitive to the chemistry of the interface, will open the door for new research directions in oxide nanocomposites," said Blas Uberuaga, lead researcher on the effort.